In the days before the current 6.5mm craze, cartridges with a “metric” bullet size in the name never really caught on in the US. The popular cartridges; 308 Winchester, 223 Remington, 30-06 Springfield and 300 Winchester Magnum all share imperial unit bullet designations. The 7mm Remington Magnum stood among these “inch” giants as the lone metric. Often shortened to 7 Rem Mag (that’s what I always called it), it offers impressive ballistics and terminal performance making it is an extremely popular big game cartridge. While hard hitting magnum cartridges are admired but hunters, the 7mm Remington Magnum always stood out because it’s recoil is more manageable in a hunting weight rifle. For many shooters, it is the most powerful belted magnum they can shoot from a hunting rifle without the use of a brake. I’ve hunted game with a 7mm Remington Magnum on three continents and consider it one of my all time favorites. Long range shooters have shown an interest in the 7mm. Paired with the right bullet, you can send a heavy projectile a long way with impressive ballistic performance. Of the 7mms used in matches, the 284 Winchester, 7mm Short Action Ultra Magnum (SAUM) and 7mm Remington Magnum seem to be the most popular with the long range crowd. What reads like a short list dominated by 2 largely defunct hunting cartridges (284 Win and 7 SAUM), represents cartridges with excellent downrange potential. The 284 Winchester and 7 SAUM both have a short powder column, decent neck length and fit into a short action length receiver. When I went to build a custom 7mm precision rifle, I looked at those three choices, glanced backed at my massive pile of 7mm Remington Magnum brass and decided that was the way to go. Editor’s note: for what it’s worth, I almost added 7mm-08 to the list, but I think it is much more popular in the hunting realm. Why build a 7mm? Well, the Sierra 197 gr. MatchKing (#1997) with it’s impressive advertised G1 BC of .780 above 2,300 feet/second! Wow! If that doesn’t make you want a 7mm I’m unsure what will. While I was shooting my 7 Rem Mag I also decided to test the 183 gr. SMK (#1983) with its .707 G1 BC at velocities above 2,300 feet/second, which it isn’t too shabby in its own right. For comparison purposes, I lined up a .308″ 175 gr. SMK (left) with the .284″ 187 gr. SMK (center) and 197 gr. SMK (right). The 7mm bullets almost look like they want to slice through the air just sitting there. If you didn’t notice, they are long. The 183 gr. has a nominal length of 1.597″ while the 197 gr. is ~1.716″, WOW! Shooting bullets as long as these require specialized equipment. Sierra recommends a minimum of a 1:7.5″ twist for the 197 SMK and 1:8″ for the 183 SMK. Most factory rifles in 7 Remington Magnum will run a twist from the 1:9″-1:10″ range. This means a custom barrel. To go along with that custom barrel, a custom reamer is most likely in order as well. A call to Krieger Barrels was my next step. I explained what I needed and they built a custom 7mm barrel with a 1:7.5″ twist in an MTU contour. For a reamer, I loaded 3 dummy rounds and mailed them off to Dave Manson at Manson Precision Reamers. He custom cut a reamer based on my samples (unfortunately, I misplaced the print). Once all the parts came in I was ready to roll and built the rifle below. I’ll cover its construction in a future post, but here it is in all its glory. The chassis is a KRG Whisky-3 folder. This is one of the nicest chassis I’ve had on a rifle. I ordered it direct from KRG. The chassis feeds from AICS style magazines. In this case, the longer 3.850″ magazine length, offering plenty of room to seat cartridges to the optimum length. I used Norma brass, CCI 250 primers and a couple of different Hodgdon powders. Even with over two decades of reloading a 7 Rem Mag under my belt, reloading for precision rifle is still new. My hunting loads were always about a lot of velocity with the heaviest bullets possible while maintaining safe pressure. This is a little different. For the 197s I was heading into unknown territory and ended up working up in 1.0 grain increments. For the 183s I had some data to work off of, so I worked in finer, .5 grain increments. I used powders I had on hand; Retumbo, H1000 and H4831SC. All shooting was done prone, from a bipod with rear bag. Target was a 1″ orange dot on white cardboard at 100 yards. Velocity data was gathered with a MagnetoSpeed V3 barrel mounted ballistic chronograph. I failed to record data for one load in the table below, this is recorded as “NA”. Of the ten different loads I shot with the 197 gr. SMK, 6 were sub MOA, 3 were sub 3/4 MOA and 1 was just over 1/2 MOA. Of the seven different loads I shot with the 183 gr. SMK, 4 were sub MOA, 3 were sub 3/4 MOA and 1 was just over 1/2 MOA. I believe with further load development these groups would improve. Taking a look at the ballistic calculator, we can start to get a feel for how these cartridges stack up against the 308 Winchester 175 SMK, 300 Winchester 190 SMK, and 6.5 Creedmoor 142 SMK. Compared to these standard 30 caliber cartridges the performance looks impressive. 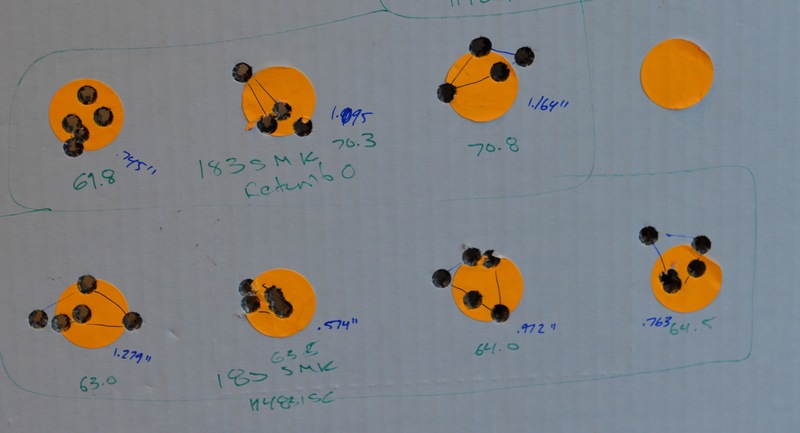 Next to the 142 SMK at 2,950, the 183 gr SMK and 197 SMK both offer a .3 MRAD drift advantage at 1,000 yards with the 183 gr. SMK requiring less elevation and the 197 SMK requiring slightly more. So, what’s next? Well, I need to finish load development and shoot this rig at longer ranges. When I do, I’ll report back!